Mailtron Gateway is a solution for businesses or homes that have multiple computer users and the need for multiple e-mail accounts and wish to not incur additional charges from their ISP for extra mailboxes. A computer on your internal network will be set up as the mail server. This server can also run Mailtron Gateway. If you already have a router for your network you are ready to go, otherwise if you want the rest of your internal network to have internet access, use a software router like IPNetShareX. 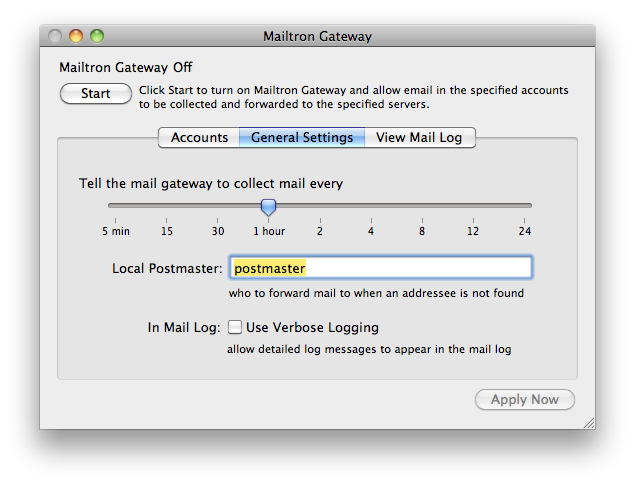 Mailtron Gateway for OS X utilizes the "industrial strength" fetchmail UNIX tool in daemon mode. Once Mailtron Gateway is registered, when activated the mail gateway will automatically start and run even without a user logged in. Information on fetchmail can be found at the fetchmail Home Page. 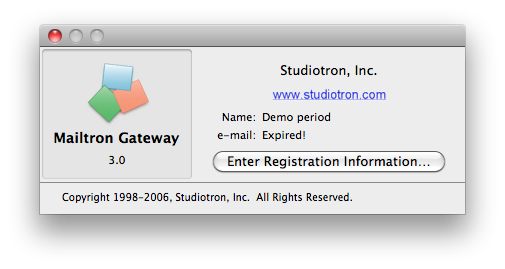 The About Mailtron Gateway window shows the registration information and indicates when the current demo period will end. The demo period is 30 days, during which the only limitation is that the fetchmail daemon will not auto start after a system reboot. Selecting Enter Registration Information... will present the registration panel. Please make sure that all registration information is entered exactly as shown in the registration confirmation email. Enter the name exactly as indicated in the registration confirmation email in the Registered Name field. Enter the email address exactly as indicated in the registration confirmation email in the E-Mail Address field. Enter the registration key exactly as indicated in the registration confirmation email in the Registration Key field. If the indicator at the top of the window says Mailtron Gateway Off then selecting Start will start Mailtron Gateway and cause the fetchmail UNIX tool to run. If the indicator at the top of the window says Mailtron Gateway On then selecting Stop will stop Mailtron Gateway and cause the fetchmail UNIX tool to stop. Selecting Start will save any settings changes before running Mailtron Gateway. If Apply Now is selected while the gateway is on, then the gateway is stopped, the settings are saved, and the gateway is restarted. It is safe to quit Mailtron Gateway as it does NOT stop the fetchmail UNIX tool from reading and forwarding email. Accounts are edited in the Accounts tab. Select New Account... to add a new account. In the Edit Account sheet, fill in the various account fields as appropriate for your email settings. Enter the name or IP of the of your ISP's mail server in the Server To Poll field. Enter the username of the email account in the Username field. Enter the password for the email account in the Password field. To use the default envelope parsing of fetchmail check Envelope: Default (this is normally what you want.) This will enable fetchmail's standard header parsing for email addresses (see the fetchmail manual for more information on envelopes.) To specify a special envelope to parse, uncheck Envelope: Default and specify the envelope in the Envelope field. 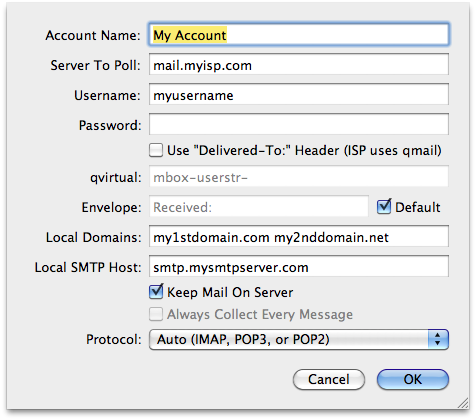 Enter the name or IP of the SMTP server on your INTERNAL mail server in the Local SMTP Host field. Select OK to add the new account to the account list. When any changes occur to the settings, the Apple Settings button will save them to disk. 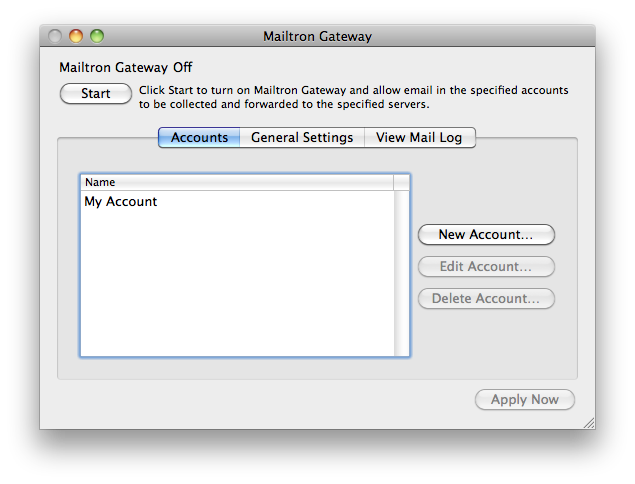 Selecting Start will also save any changes before running Mailtron Gateway. If Apply Now is selected while the gateway is on, then the gateway is stopped, the settings are saved, and the gateway is restarted. General settings which affect all accounts are edited in the General Settings tab. Tell the mail gateway to collect mail every allows you to set how often the fetchmail daemon collects and forwards email for all accounts. Set it to the desired time interval for the daemon to run. Set the Local Postmaster field to the name of the internal mail server account to which non-addressed and other non-forwarded email will be forwarded. The Use Verbose Logging checkbox indicates the level of logging you wish fetchmail to send to the mail log. Verbose Logging is valuable in debugging mail forwarding problems. The View Mail Log tab shows a live "tail" of the current mail log.